I'm so glad you liked the pictures. Ziggy is the tiger striped one and Rio is the cream one. We are loving and enjoying them so much. They literally can't stay out of the tree! It is the best product ever for cats. I'm so glad you guys make them for us to enjoy. Rio and Ziggy are brothers and they are 14 weeks old now. We just love them! Thanks again for everything! 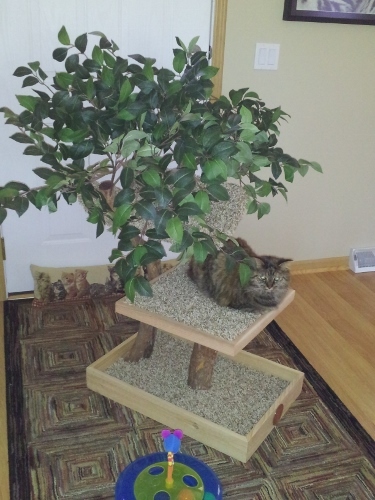 My wife and I are so excited that we purchased the mature large tree for our two cats. Since we live on the 17th floor of our building, we knew our little ones would never get to experience the outdoors, so we brought the outdoors to them. They simply love the tree. We find them up on the platforms all of the time, and they are always extremely relaxed lying on the different platforms. I initially had some buyer’s remorse spending so much on cat furniture, and then was afraid that it might get damaged in shipping. All of these fears were alleviated when it arrived. It was professionally packaged, and arrived in without incident. The craftsmanship is second to none. The materials are all top-notch, and it is a focal point of our living room. I can't say enough about your customer service, and help with the tree's design so that it fits perfectly in our home. Thanks again for taking such great care to build such an incredible product. We are enjoying our Sycamore! I just wanted to let you know that I received my tree yesterday and it is wonderful ! The workmanship is beautiful and it was so easy to set up. I kept my cat, Lily Belle, in another room until I had it ready and when I let her out, she ran over to it and started looking at it and within minutes was comfortably lying in the top perch, tail swinging. She loves it. Thank you so much. 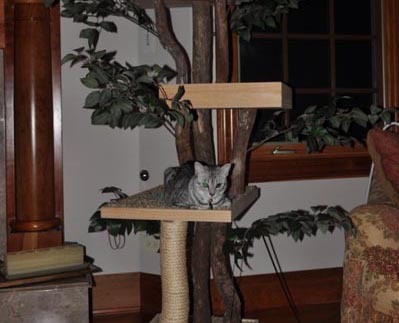 If anyone I know is looking for a really top quality pet tree house, I will be recommending yours. 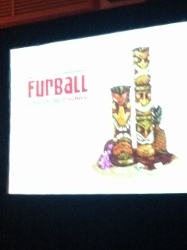 My husband and I were at the SPCA Fur Ball and were the lucky winning ?bidder for your cat tree. Standing in the back part of the room, we weren't able to see the whole tree. We had to laugh b/c we had no idea that they would be auctioning your tree, and had just commented how much we liked it. When it came up for auction we pounced on it! Ha!Once the auction was over and we were able to see it in its entirety we could not have been more pleased. We have many four legged babies and have some cute pictures of them enjoying their new toy and sleep spots. I can put the pictures on a disc and send them to you, or I can email them.Thank you for coming up with such a beautiful alternative to what you normally see out in the stores. 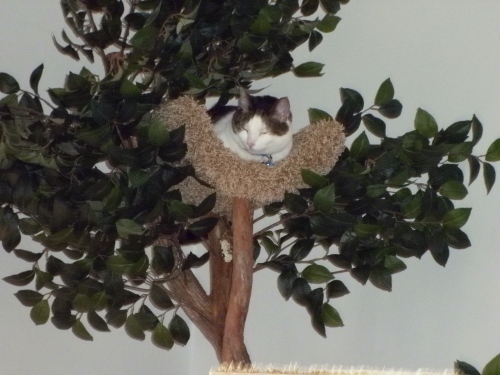 Our friends and family comment that they would love to be a cat in our house just to be able to play and lounge on the tree! We pounced to get your tree! 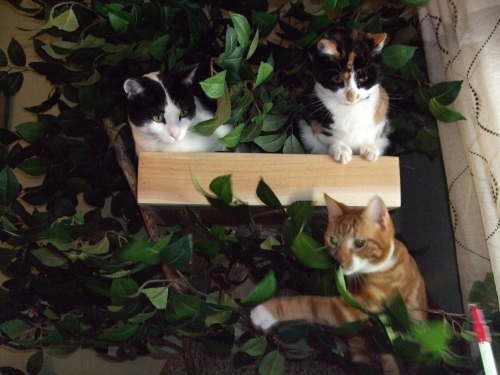 Thanks again for sending me the extra leaves for my tree and for the nice note.My cats just LOVE their tree house!!! They sit, play, hang out, climb, sleep, and clean themselves on it... at any given point during the day, there is always someone taking advantage in one way or another.I have attached a few photos of the kittens enjoying themselves. Boris has really claimed it as his own. I received a seedling about a month ago. My 4 cats LOVE it because they can hide, play and sleep in it. But I love it because it's pretty in my home, sturdy and hold up under the rough play of my two younger cats, and it's so easy to keep clean which is very important to me since my one cat has asthma. 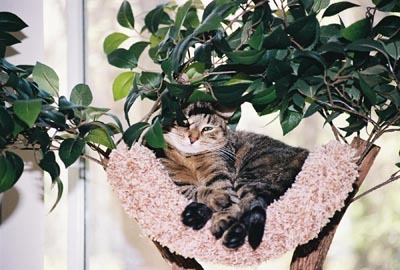 In fact, attached is a photo of my asthmatic cat, Matilda, in her tree. She loves playing in the leaves! We were sooooo excited! Our cats absolutley love the trees. 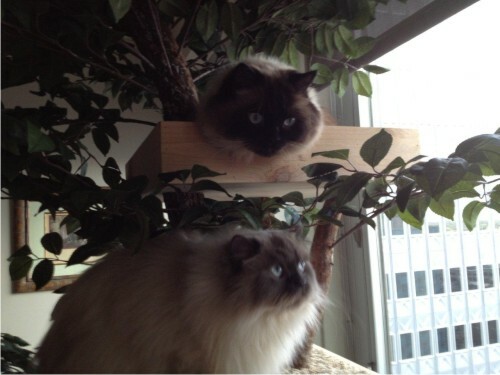 They are in heaven and feel like they have their own jungle in their house! They have explored every nook and cranny and tested every branch. They love to hide in all the leaves and them jump out at us and each other. It is better than we could have imagined! Thank you soooooo much! Their own jungle in their house! 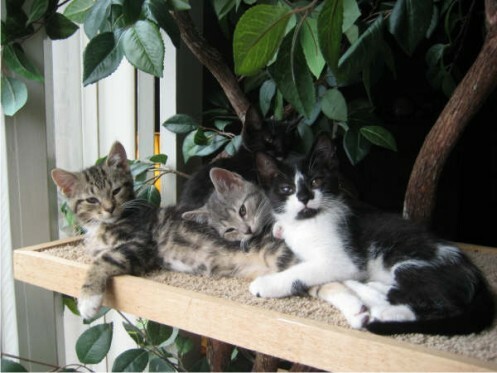 We just wanted to thank you so much for our beautiful, custom ?made Cat Tree House!? ?The kitties were practically on it before we completely pulled it out ?of the box! ?We have tried time and time again to get a good picture with everyone ?on the tree and will continue to do so, but for now we thought you ?would like this one!? ?Thank you for an amazing product!! 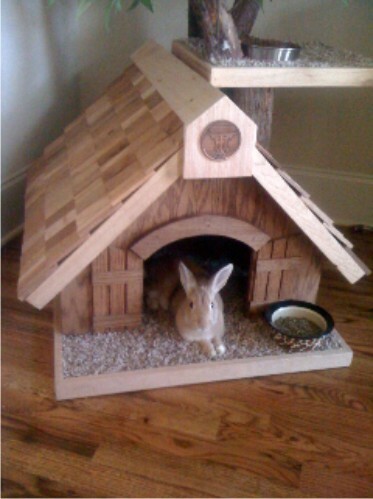 ?We are so pleased and it is truly a beautiful piece of furniture that ?enhances the home we share with our furry friends! 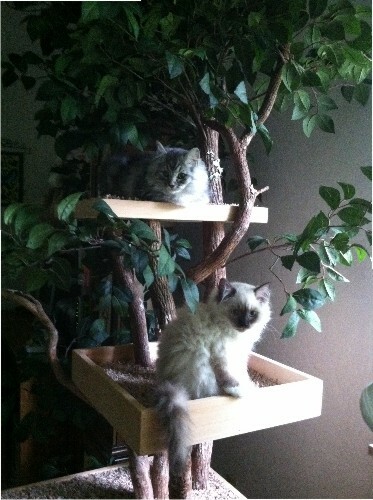 We love our beautiful custom made Cat Tree House! He uses the sisal scratcher, a little tentative yet, but he will get used to it. Speaking of getting used to it-the first week I kind of forced him to climb the tree by putting his 'baby' in various places in the tree. He had to climb it to get her down. I'd ask him, "where's Miss Kitty? ", he'd look immediately up the tree, then give me a look that said, 'not again!?'. It was so cute! Now he doesn't need coaxing, as a matter of fact, he has spent nearly all day sleeping in the cradle today! Didn't even bother to get down when a neighbor knocked on the door-which normally sends him under the bed-and even stayed when I pulled her inside to see him! ?I have more pics of him in the tree, will try to attach to this email, but they may end up coming separately. ?By the way, he loves fighting the leaves and trying to eat them! I assume they are non-toxic, because you are so careful with all your materials being animal-friendly. It was so funny the first time I saw him trying to rip them apart-the leaves hold up admirably well! ?Thank you so much again! There is no way I can convey my appreciation appropriately well for all you did for me, so you will hear thank you from me often!